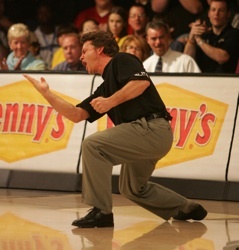 Voss has been one of the top stars on the PBA Tour since 1982, a threat to win any event in which he enters. He has been among the pioneers and pacesetters, breaking the bowling barriers one by one. He won $100,000 in a year, then more than $200,000, thenbecame the seventh in history to achieve the million dollar mark in career earnings. Along the way to his 23 titles, he won the PBA National Championship and was named PBA Player of the Year in 1988. And he did it all with a boyish flair, bringing attention to the sport because of his great talent and his natural poster boy qualities. Voss won his first PBA tour title in 1983. It was an unusual title match, with Voss and challenger Pete McCordic tying after the standard 10 frames with an unusually low score of 176; Voss took the championship in an extra 9th/10th frame roll-off. The 1980s saw him win his only major title, the 1988 PBA National Championship. Also in 1988, he earned a then-record $225,485 and was named PBA Player of the Year. Voss enjoyed his best career stretch from 1987-1998, winning at least one title in 12 straight seasons — four short of the record 16 seasons now held by Walter Ray Williams, Jr. He suffered a broken wrist at the beginning of the 1999 season, and the streak ended. He has collected over $2.3 million in career PBA earnings, and currently stands fifth all-time in that category. He was known for exceptional versatility, being able to bowl well on multiple oil patterns. According to pba.com, Voss was "a threat to win any event in which he entered." * Was ranked #13 on the PBA's 2008 list of "50 Greatest Players of the Last 50 Years"